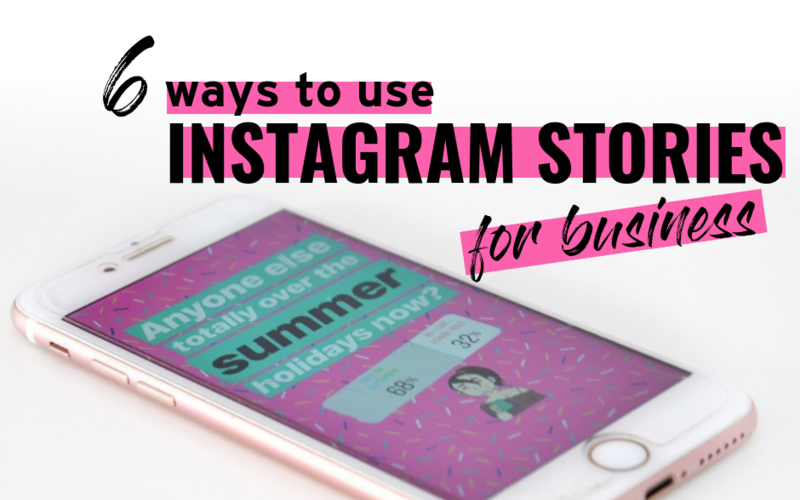 If you’re not using Instagram stories for your business already then this is your virtual kick up the behind to get on it! 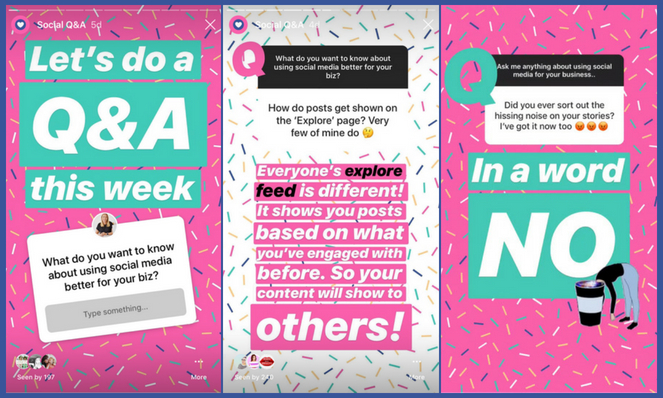 Stories are growing at 15 times the rate of the newsfeed so it’s really important to get your brand on them so you are seen by the customers you are trying to engage. Velvet Hove use their stories so well to show off their products every day. 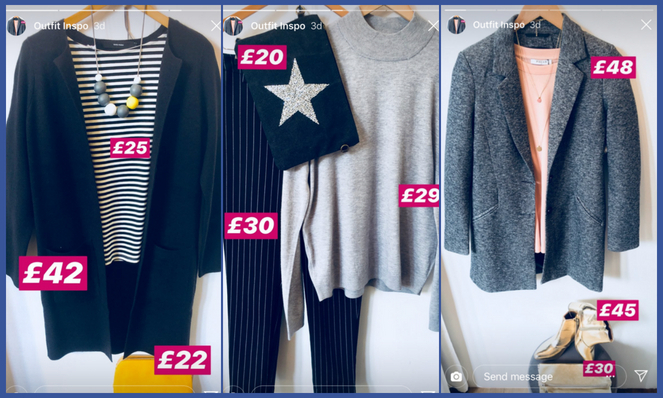 They share outfit inspiration and regularly use video, photos and boomerangs of their staff modelling the outfits. They add bold text to highlight details like price etc. 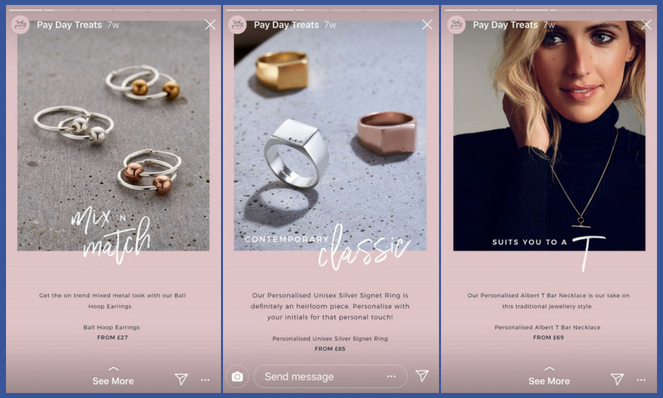 Posh Totty Designs use a mixture of images and text to show off their jewellery, and as they have over 10,000 followers they get to add a swipe up link so their followers can easily make a purchase. You can use an app such as Unfold to create something like this. Using the new questions feature is a really good way to get people to interact with you and you can use it for so many different things. For a service based business you can use it to answer questions your customers want answers to just like I have above. I’ve also added the answers to all these questions to my highlights so people can see them in the future. Asos regularly use the questions feature to engage with their customers and answer questions about style or products. People are nosey, they love to know how things are made or how you run your business, so show them behind the scenes. 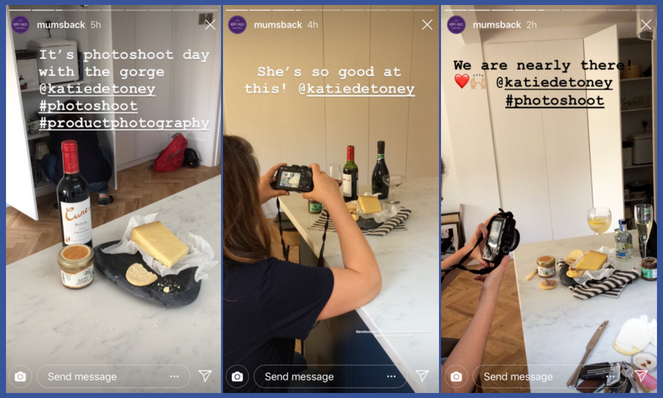 Sally from Mums Back recently shared behind the scenes of a photo shoot she was having so we got to see what goes into her business. She cleverly tagged in the photographer so that she will be able to repost the story so her followers can see it too, and hopefully that will bring them over to check out Mum’s Back. Martha Brook Stationary goes one step further and shows BTS shots of their fantastic images. Of course you don’t have to go this far! Video might be the most nerve wracking thing of all but you know that saying, people buy from people, so show them who you are! 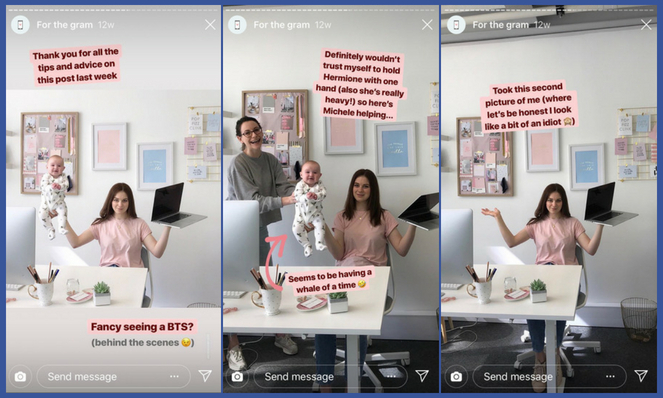 People love to get to know the person behind the brand and Instagram stories are the perfect place for that. Don’t be scared to share snippets of your day with us. If you’re funny in real life, show us, but be authentic. This one is best done with a bit of pre-planning and promotion. Live’s are great if you have a new product to launch as you can invite everyone to the official launch, show people behind the scenes of production or invite feedback about the product that you’re announcing. Oh My Cakery uses her live’s to show people exactly how much work goes into her incredible cakes and you can often find her filling and decorating a cake on a live broadcast, talking her followers through the whole process! You can also use them to interview an influencer, or a panel of industry experts. Be creative and check out what other people are doing in their live broadcasts. 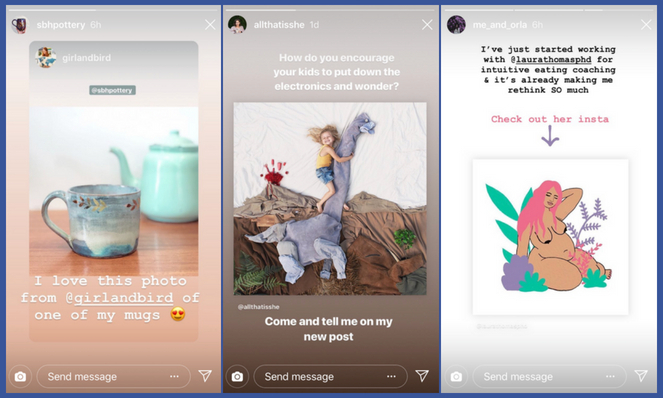 If your customers are sharing images of your products use them in your stories! If they’ve mentioned you on another platform, screen shot it and share it in your story, reviews work really well in stories too! 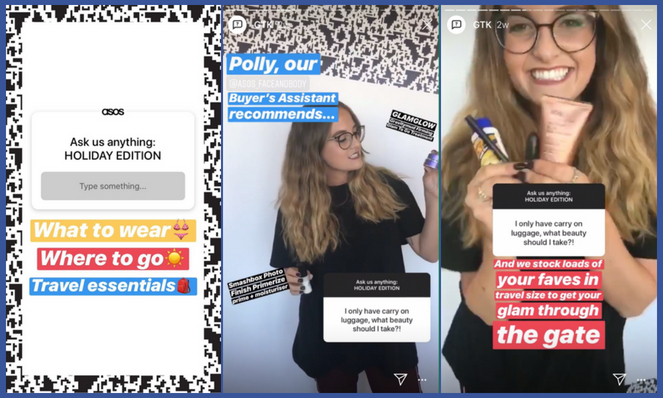 If customers are mentioning you in their Instgram stories, you can simply hit the ‘add this to your story’ option when you get the message notification. As expertly shown below by SBH Pottery. Share images from someone else’s grid to your story too. Simply hit the paper aeroplane icon and select share ‘add post to your story’. This is great way of sharing other peoples images like Me And Orla has, or directing people to your own latest image as you can see in All That Is She’s story. And of course you can use gifs, text or tags to make it even more engaging. 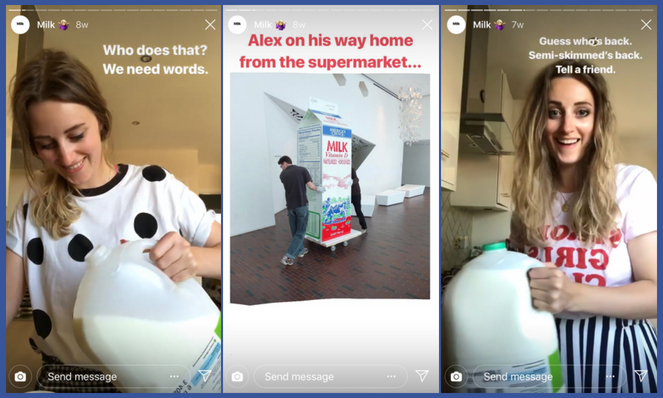 Three important things to remember when creating Instagram stories. Make text easy to read. Big, bold text is easier to read than small text which blends in with the background image. Stay on brand. If you have a ‘look’ stick with it and if you don’t then stories is an ideal place to create your own. Weeslice does this well as all her stories are instantly recognisable by the colours and gifs she uses. Don’t talk too much! Stories are designed to be 15 seconds long for a reason! If you have a lot to say then consider hosting a live broadcast instead of sharing hundreds of short stories..